Black Nightshade Poisoning is the accidental or intentional intake of the plant or plant product containing the compound. What is Black Nightshade Poisoning? What are the Causes of Black Nightshade Poisoning? What are the Signs and Symptoms of Black Nightshade Poisoning? The signs and symptoms of Black Nightshade Poisoning can vary from one individual to another. It may be mild in some and severe in others. Several systems of the body, such as the digestive system, nervous system, vascular system, and ENT may be affected. How is First Aid administered for Black Nightshade Poisoning? Who should administer First Aid for Black Nightshade Poisoning? 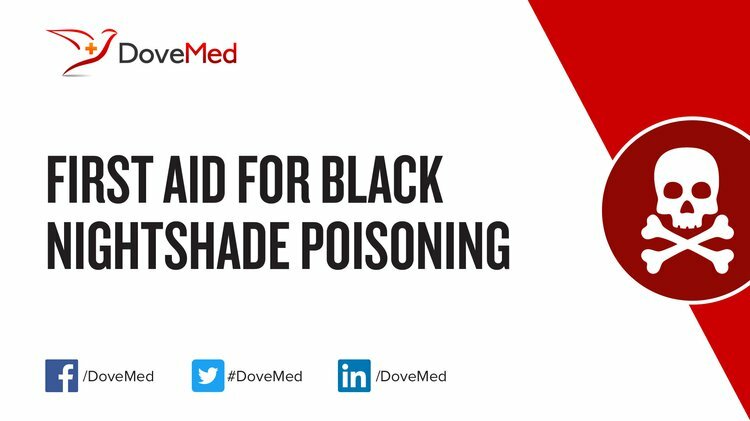 First aid for Black Nightshade Poisoning is administered by healthcare professionals. What is the Prognosis of Black Nightshade Poisoning? How can Black Nightshade Poisoning be Prevented? Jain, R., Sharma, A., Gupta, S., Sarethy, I. P., & Gabrani, R. (2011). Solanum nigrum: current perspectives on therapeutic properties. Altern Med Rev, 16(1), 78-85. Baniameri, V., & Cheraghian, A. (2011, November). The current status of Tuta absoluta in Iran. In International symposium on management of Tuta absoluta (pp. 16-18). Atanu, F. O., Ebiloma, U. G., & Ajayi, E. I. (2011). A review of the pharmacological aspects of Solanum nigrum Linn. Biotechnology and Molecular Biology Reviews, 6(1), 1-8. Wei, S., Zhang, C., Chen, X., Li, X., Sui, B., Huang, H., ... & Guo, F. (2010). Rapid and effective methods for breaking seed dormancy in buffalobur (Solanum rostratum). Weed Science, 58(2), 141-146. Luo, S., Xu, T., Chen, L., Chen, J., Rao, C., Xiao, X., ... & Liu, Y. (2012). Endophyte-assisted promotion of biomass production and metal-uptake of energy crop sweet sorghum by plant-growth-promoting endophyte Bacillus sp. SLS18. Applied microbiology and biotechnology, 93(4), 1745-1753. Fidan, T., & Kirpinar, I. (2011). Psychiatric Aspects of a Case With Deadly Nightshade Intoxication/Bir Çocukta Deli Ban Otu Zehirlenmesinin Psikiyatrik Yönleri. Journal of academic emergency medicine, 10(2), 86. Slaughter, R. J., Beasley, D. M. G., Lambie, B. S., Wilkins, G. T., & Schep, L. J. (2012). Poisonous plants in New Zealand: a review of those that are most commonly enquired about to the National Poisons Centre. New Zealand medical journal, 125(1367), 87-118. Swain, K. C., Nørremark, M., Jørgensen, R. N., Midtiby, H. S., & Green, O. (2011). Weed identification using an automated active shape matching (AASM) technique. biosystems engineering, 110(4), 450-457. Glynn, J. M., Islam, M. S., Bai, Y., Lan, S., Wen, A., Gudmestad, N. C., ... & Lin, H. (2012). Multilocus sequence typing of ‘Candidatus Liberibacter solanacearum’isolates from North America and New Zealand. Journal of Plant Pathology, 94(1), 223-228.